The Registrar of Voters website, which had been redesigned to feature more graphs and other visual elements to make the data more accessible to the general public, remained inaccessible most of the night. 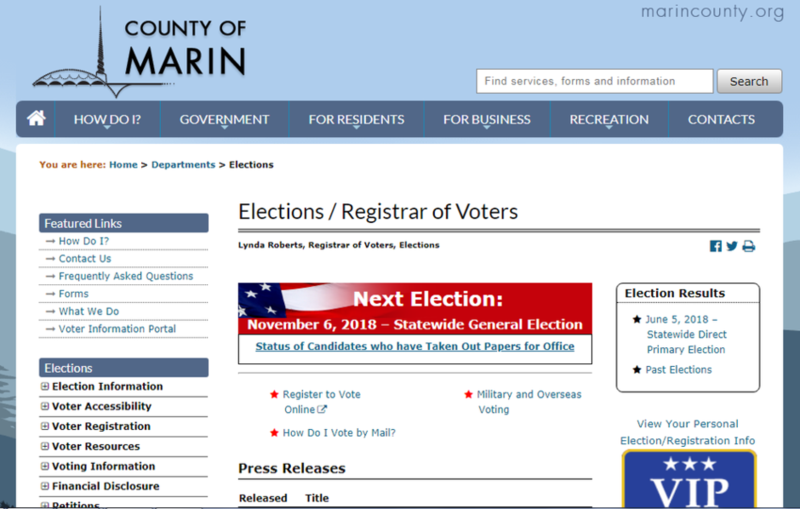 Old code, software problems and server configuration in Marin County, combined with heavy traffic, caused the blooper that made it impossible for the public to view results on election night June 5, county officials said this week. “We determined that it was a combination of three things,” said Liza Lowery Massey, director of Marin County’s Department of Information Services and Technology. Specifically, Massey said there was some antiquated legacy software code in some of the county’s Web pages. She said that older code has now been removed. Massey said server configuration also was a problem. She said the county’s computer system has been reworked to remove that roadblock. Also to blame for the snafu was the foundational software that underlies all of the county’s websites. This software was upgraded earlier this year, before Massey began working for the county at the beginning of May. “We found some issues that were in that setup that didn’t become so apparent until the election-night traffic load,” Massey said. Those issues have also been dealt with. Massey said the new graphics features that were added to the Registrar of Voters website didn’t appear to play a significant role in the crash. The county is stress testing the system to ensure there won’t be a repeat performance during the Nov. 6 election. It purchased a tool to do such stress tests after the June 5 election. Massey said the stress tests are being done quarterly and before any expected surge in traffic. “We went through the Marin County Fair, which doesn’t equal elections but does cause a surge, and it went fine,” she said. The county also is preparing a Plan B for the next election just in case. Roberts said she may forgo some of the extra graphics attempted during the June 5 election. ©2018 The Marin Independent Journal. Distributed by Tribune Content Agency, LLC.